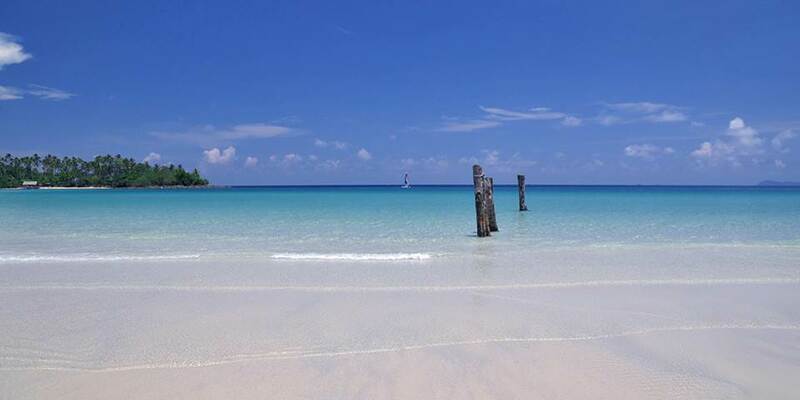 Located 80 kilometres off the Thai mainland the island of Koh Kood is home to the idyllic resort of Soneva Kiri. One of Thailand’s largest islands, yet with fewer than 2000 villagers, this secluded island paradise remains undeveloped with ancient rain forest sloping down to deserted beaches. A profusion of activities; exquisite wellness Six Senses Spa, hiking, mountain biking, water sports, even an Observatory with a state-of-the-art telescope, a copious number of experiences wait on the island, the resort even has a list to choose from. Special dining at one of the 3 restaurants, including an enchanting and unforgettable Treetop Pods experience, this is one of the highpoints of any visit to Soneva Kiri that takes haute cuisine to new heights, literally. Once seated in our bamboo pod at ground level we hoist you six metres up into the topical foliage while an acrobatic waiter swings between the trees on a zip line to deliver baskets of your pre-selected wines and gourmet delights. Other gourmet delights consist of The View, our aptly named fine dining restaurant that juts out from Koh Kood’s rocky cliff over the Gulf of Thailand’s cobalt waters and the rustic chic Dining Room poised among towering tree trunks on rocky cliffs above the sea When the sun sets beyond our captivating horizon, the Cooking Hut turns out wholesome Thai and Mediterranean classics and creative fare from the wood-fired rock oven, a hot and cold smoke oven, and an Indian tandoor. 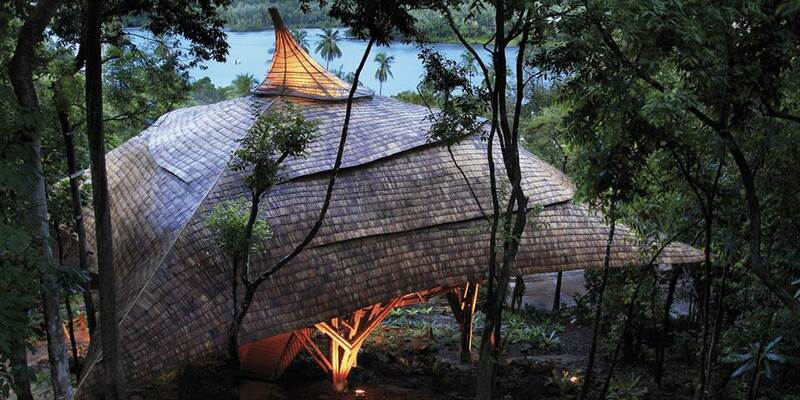 The Den is a magical manta-shaped bamboo play house open every day for delighted children. It is a wonderful playground, a chance for them to paint or play Thai musical instruments. Your loved ones will be in the constant care of our head child minder, who is adored by all our Den regulars. At the Cinema paradiso snack under the stars while watching stars of-screen at our private screening ‘room’ on a reservoir where timeless classics and contemporary films are complemented by a fun American-style menu of miniature fish burgers, homemade popcorn, melt in the mouth chocolates and creative cocktails. 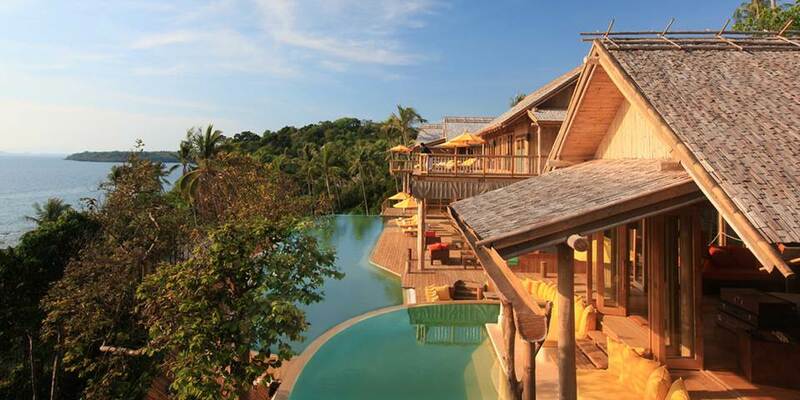 All 29 villas have been built from local sustainably sourced timbers and are designed to blend in with the landscape. 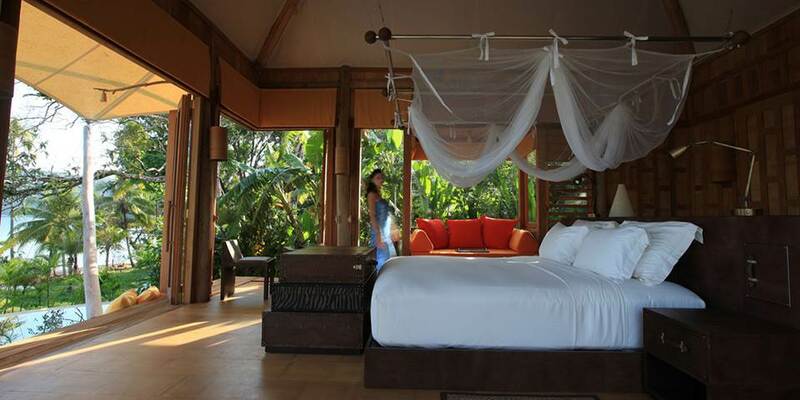 All are vast and luxurious and furnished in effortlessly chic style with some facing the sunset, some sunrise. Each has a private swimming pool which wraps seductively around the accommodation. A wide range of villas is available from intimate one bed roomed suites for a romantic getaway to five and six bedroom reserves. 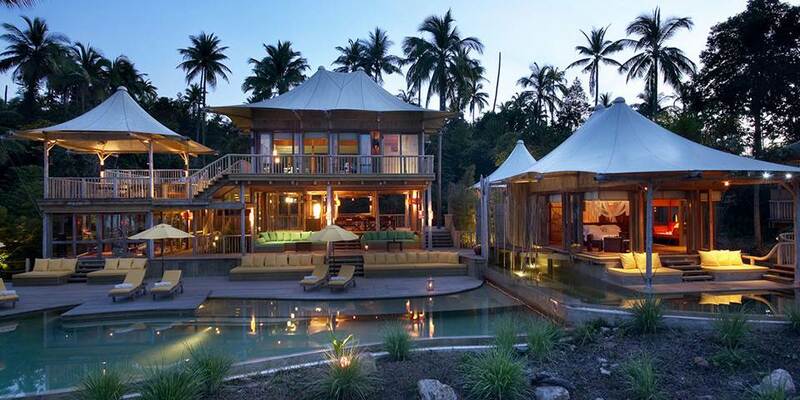 Whether it is a cliff side castle in the soaring rainforest or a beachfront retreat. Enjoy the entertainment facilities of the living pavilion, luxuriate in the starlit outdoor bathroom and sleep soundly between the organic cotton sheets of the king sized bed. An environmentally friendly buggy awaits when it is time to explore. The five bedrooms Private Beach Reserve is the ultimate address at Soneva Kiri, perfect for a family or group of friends nothing here has been left to chance, laze around the 208 square metre pool, and indulge in a massage on the spa deck or exercise in the private gym. Children will love the amazing tree house with snug bunk beds and the slide which snakes into the pool. The private wine cellar is stocked in readiness for long lingering dinners at the dining table on the weathered deck.